In the sea of orange t-shirts, there was a sense of solidarity. On March 14, one month after the violent Parkland shooting at Marjory Stoneman Douglas High, thousands of students across the nation walked out of school at 9:55 AM. The majority of CHS participated. Students left their classes and stood in the courtyard for 17 minutes to commemorate the 17 victims who died in Parkland. “I liked how we focused on the victims, I think that because we’re talking about policies we become desensitized to the violence,” said Sophia Ma, junior. Many students walked out to support the people killed at Parkland. Others walked out to protest the gun violence that is becoming increasingly prevalent in today’s society. Even more walked out to protest the inaction of federal and local governments in creating anti-gun legislation. All walked out in unity, in frustration and in remembrance. “I approve of it, I’m glad that we’re all doing this to honor the 17 people that were killed in the Parkland shooting,” said Ella Shapard, junior. During the 17 minutes, various speakers read poems, speeches and the names of the victims. Sarah Warner and Eliza McClamb, juniors, both read poems they had written on gun violence. Cameron Farrar, Jonah Perrin and Class President Niya Fearrington, all seniors, urged students to continue to take matters into their own hands, use their voices and head to the polls to vote. “I thought it was really cool; I loved to hear everyone’s perspectives on things and how we came together as one. I enjoyed how we all were quiet, it really showed camaraderie and togetherness,” said Caleb Martin, sophomore, about the walkout. Across the district, there was a huge turnout of students as well. 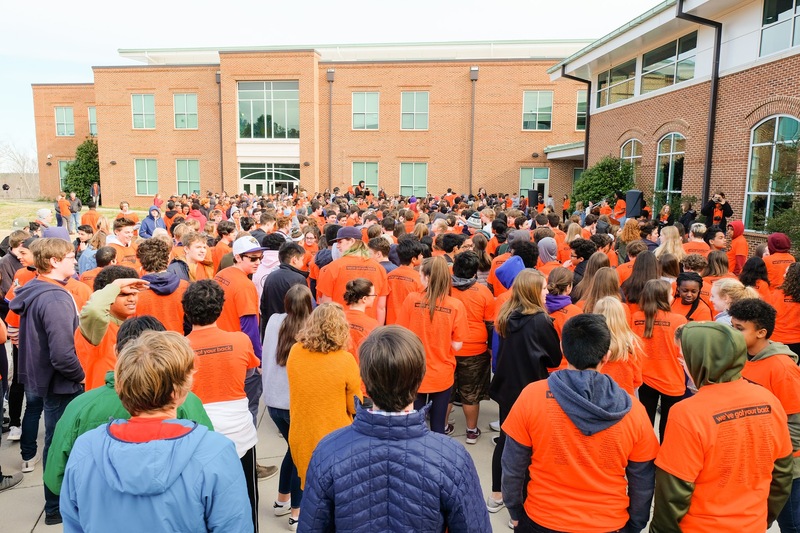 At East Chapel Hill High for example, around 1,500 students walked out. At Chapel Hill High, a large number of students also participated in the protest. Ultimately, despite differences in motives, opinions and agendas, CHS students came together today under a common thread: remembering the Parkland victims and using their voices to speak out. “I think that [the walkout] was a very powerful symbol that we’re not just going to lay down and take this; we can’t keep letting this happen. We can think and pray, but it doesn’t really do anything when we think and pray. We need to keep fighting until something actually gets done; this movement can’t be temporary,” said Marcus Fontaine, senior. Organizers spoke about continuing protests, including the March for Our Lives rally in Washington D.C. on March 24. Organizers of the walkout, including Perrin, are planning on attending and will host an interest meeting Thursday, March 15, in room E216.